This post is sponsored by Amazon Handmade, but all gift picks and thoughts are my own! Have you gotten all your holiday shopping done yet? I haven’t—last minute is my usual style—but I got a head start by picking out some things on Amazon Handmade for some special people in my life. As you’ve heard me mention a million times, this year I’m focused on shopping sustainably. While that rule doesn’t necessarily have to extend to my gift shopping, if I can manage to incorporate some sustainable gifts why not do so? I regularly shop for things like pet supplies on Amazon because of the convenience of Prime two-day shipping. But I had no idea Amazon Handmade would give me the same fast shipping while letting me shopping sustainably! 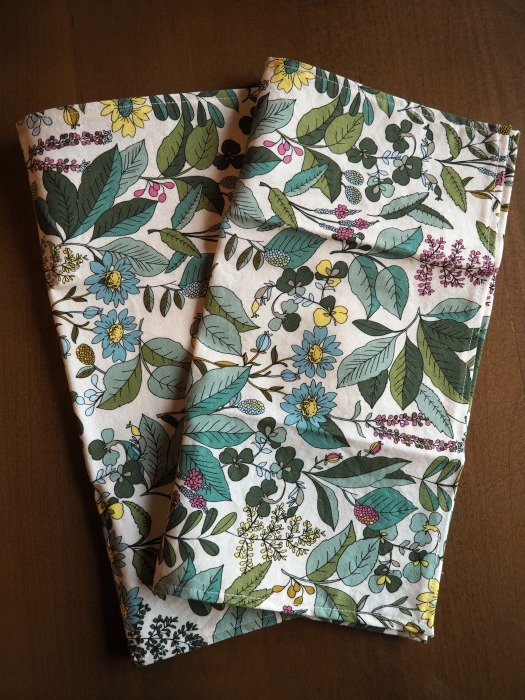 Aren’t these cloth napkins beautiful? 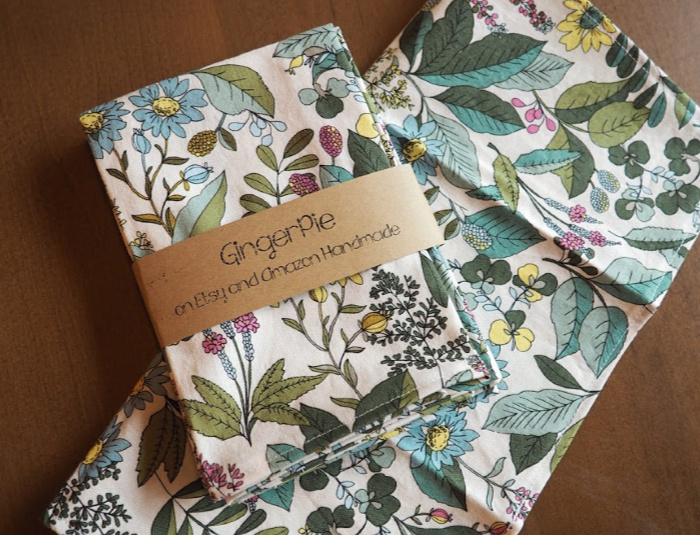 I love the idea of giving handmade kitchen linens as gifts because not only are you supporting a small business (in my case, a local one to boot! ), but you’re also giving something unique and practical that can be used again and again. I think cloth napkins might be seen as formal or old-fashioned, but I like the idea of choosing a modern print, using them all the time, and making them the new normal! 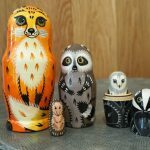 Another awesome sustainable gift I found on Amazon Handmade was a set of handpainted nesting dolls. I got them for my “niece”—my best friend’s daughter. She might not be old enough to pull them apart yet (she’s almost 2) but she can definitely have fun stacking them with mom’s help, and they’ll be cute as decorations for her room. 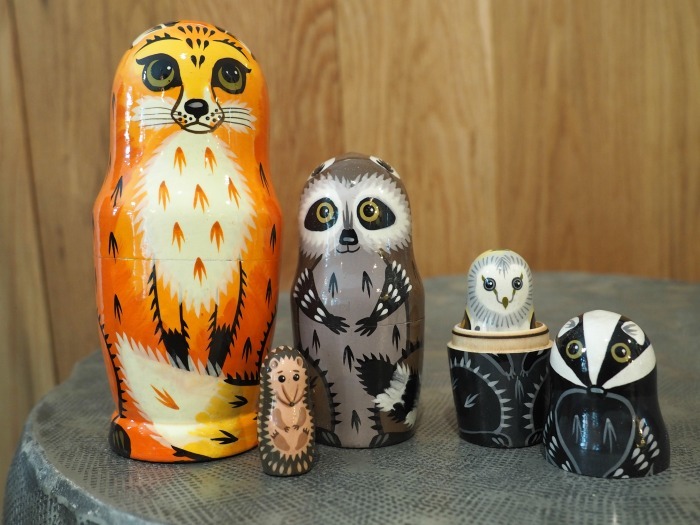 Aren’t these nesting dolls adorable? I absolutely love them. I hope the little chickadee likes them and thinks of me when she sees them as she grows up. There are so many gifts to choose from on Amazon Handmade that you’re sure to find something for everyone on your list. More than 50% of the selection is customizable and made-to-order so you can ensure all of your favorite peeps are getting something extra special. Bonus: If you’re a Prime member, get 20% off a selection of Amazon Handmade items when you shop between November 15th and December 31st! 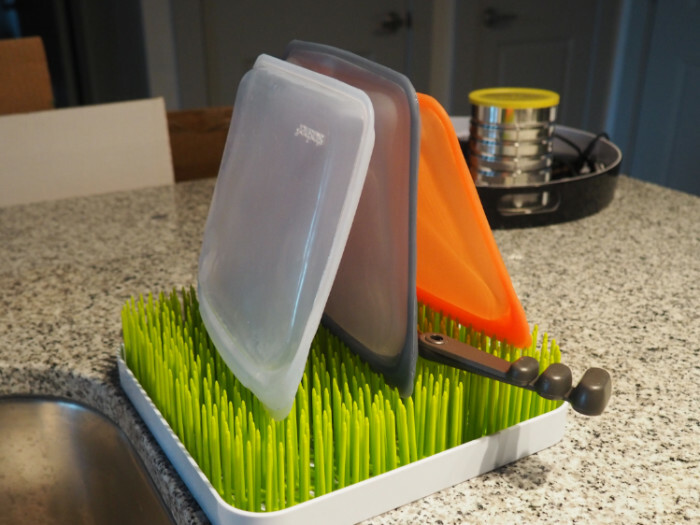 Is there anyone who couldn’t use another cutting board? This two-toned one is particularly beautiful and can be personalized with the text of your choice. This beautiful set of nine plant markers is perfect for the green thumb who grows their own herbs. These can be used indoors or outdoors and will last forever. I think whiskey stones are the coolest idea, but I don’t really know any whiskey people to give them to! You chill them in the freezer, then use them keep drinks cool without diluting them. These ones are particularly neat (get it, neat?) because they can be engraved with an initial. I hope this little gift guide has given you some great ideas to complete your holiday shopping this year. Remember, visit amazon.com/handmadegifts to shop, and don’t forget that between November 15th and December 31st there are lots of items 20% off exclusively for Prime members. Happy shopping! This post was sponsored by the Arbor Day Foundation. All opinions my own. It’s almost the end of the year, so I’ve been reflecting a lot on whether I’ve met my two 2018 New Year’s Resolutions: to shop sustainably all year, and to read 12 books—one per month. Regarding my reading goal: on paper, it looks like I failed, clocking only 8.5 books so far. But two of them were over 1,000 pages, so I’m pretty sure it all adds up to 12. The mission of the Arbor Day Foundation is to inspire people to plant, nurture, and celebrate trees, and their line of coffees does just that. Arbor Day coffee beans are grown slowly and in harmony with the rainforest, benefiting from natural shade protection and nutritious soil. Not only do rainforests provide the perfect environment for coffee to grow, but planting coffee there actually preserves forests, unlike the traditional clear-cutting method that eventually renders the land infertile. In addition, the Arbor Day Foundation helps farmers implement more responsible coffee production practices and earn a better wage. And of course, their coffee tastes delicious. 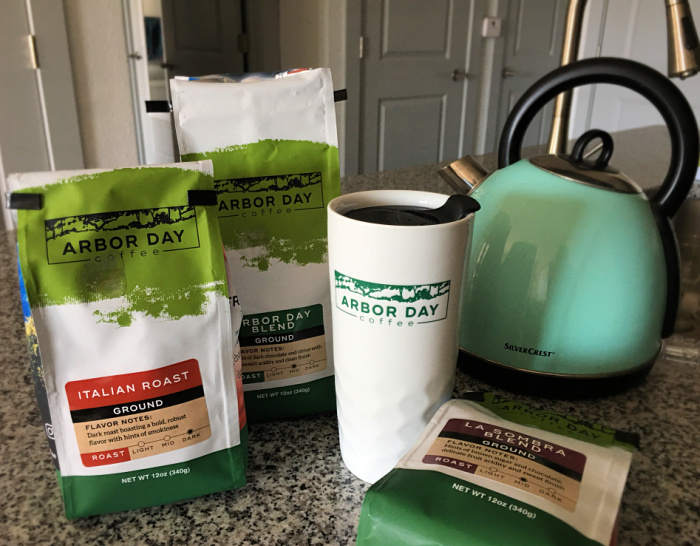 A great way to get familiar with Arbor Day Coffee is to join their Coffee Club. After you sign up, you’ll receive a 12 oz. bag of ground coffee and a ceramic travel mug like the one I have above. In your next shipment, you’ll get two 12 oz. bags of coffee. You can choose to receive your Coffee Club shipments every four, six, or eight weeks, so no worries if it takes you a while to go through your coffee. And if you’re caffeine-sensitive, you can request that your coffees be decaf for only 50 cents extra. As you can see, drinking Arbor Day Coffee in the morning is just another small way to contribute to my 2018 sustainability goal. 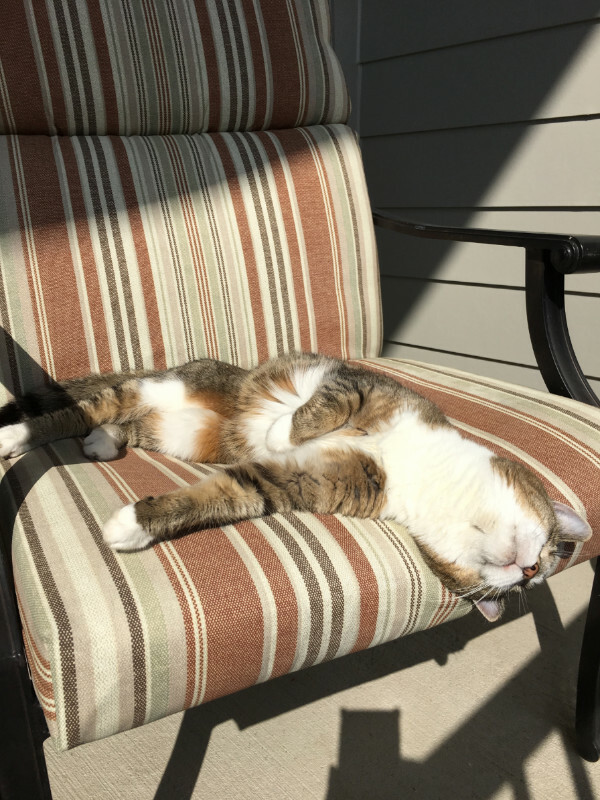 Wanna join me? Click here to shop Arbor Day coffees or subscribe yourself or someone you love for the Coffee Club box. Don’t forget to use our code EATMOVEMAKE or 10% off your purchase! 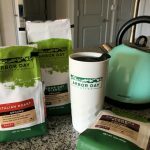 You can also enter the giveaway below for a chance to win a prize pack of 12 bags of Arbor Day Coffee worth close to $100! Good luck! Since I’m interested in sustainable living, it follows that a lot of my favorite influencers are too. One influencer that I especially love is Hannah McNeely. 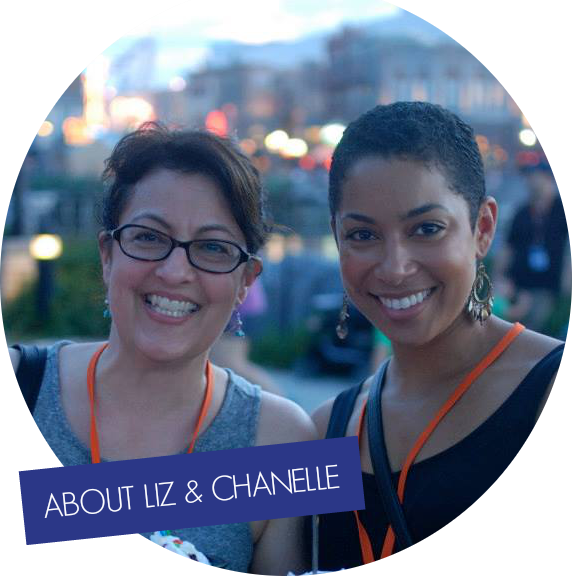 She shares lots of delicious, fresh vegan food, ways to reduce waste in daily life, and overall just seems like a positive and fun person to know. It’s through Hannah that I first heard about Who Gives A Crap; my interest was piqued when Hannah said she was trying their toilet paper out because it’s a lower waste alternative to traditional toilet paper. Coincidentally, a few weeks later I had a message in my inbox from no other than Who Gives A Crap, asking me if I’d be interested in trying out their toilet paper. And that’s the backstory of this Who Gives A Crap review. Guys, Who Gives A Crap isn’t just regular toilet paper. It’s toilet paper for cool people. 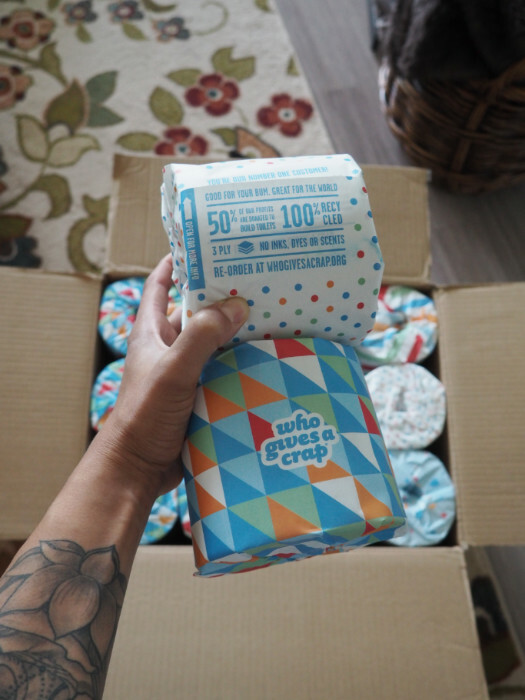 The paper itself is 100% recycled and comes in all recyclable, brightly colored packaging, and 50% of the company’s profits are donated to their charity partners to help build toilets for the 2.3 billion people living without one. 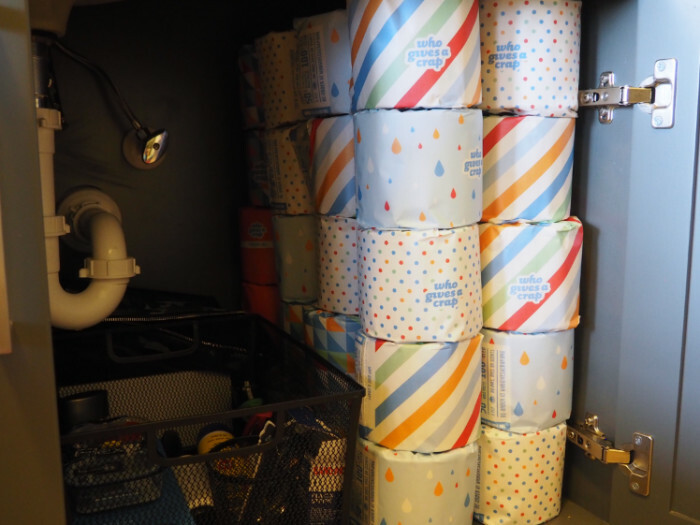 Who Gives A Crap toilet paper is good for the planet, and it looks good while doing it. 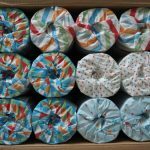 Check out the fun patterns on the paper wrapping! They even have festive special edition designs around the holidays. Each roll is printed with a few important statistics about Who Gives A Crap’s mission and environmental impact. 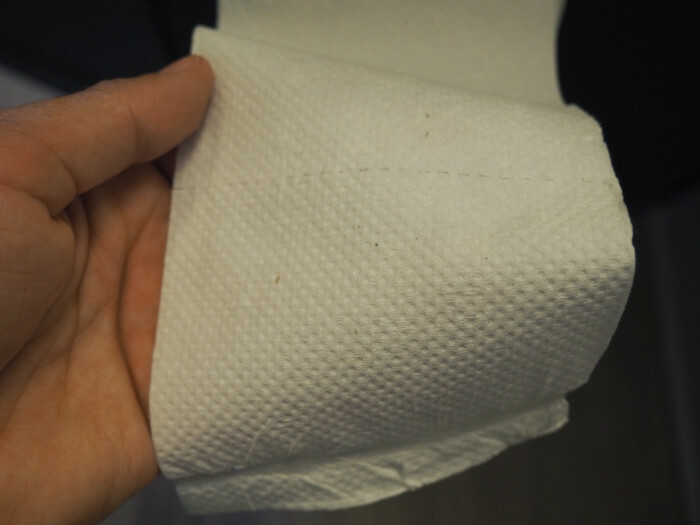 I was pleasantly surprised to find that the Who Gives A Crap toilet paper has a simple dotted texture. Nothing frilly or flowery like the generic stuff I’d been buying. I know, I know — in the grand scheme of things, the design of my toilet paper isn’t a big deal, but the simplicity of the Who Gives A Crap paper does appeal to me. Who Gives A Crap toilet paper is also luxuriously three-ply and the rolls are extra long. It doesn’t fall apart in your hand when you wipe (just sayin’) and because of that I think I’m using less per wipe than I normally would. But back to the fun stuff — the packaging. 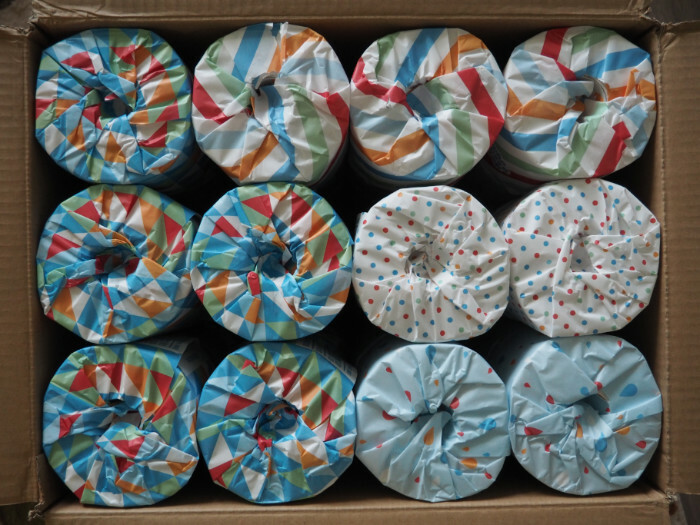 As I previously mentioned, the rolls are individually wrapped in paper. Apart from the packing tape, there’s no plastic involved at all in getting it to your house, which is great! I’ve talked before about how paper and glass can be recycled more easily and more often than plastic, so I try to choose non-plastic products whenever I can. Anyway, back to the TP. 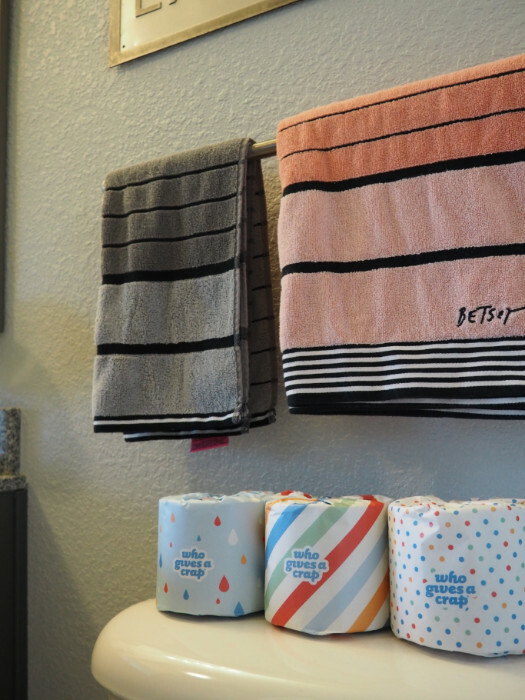 The designs on the wrappers are so bright and cute that leaving extra TP rolls out for guests becomes fun, not embarrassing! And now, opening my under-sink cabinet is a bit cheerier. 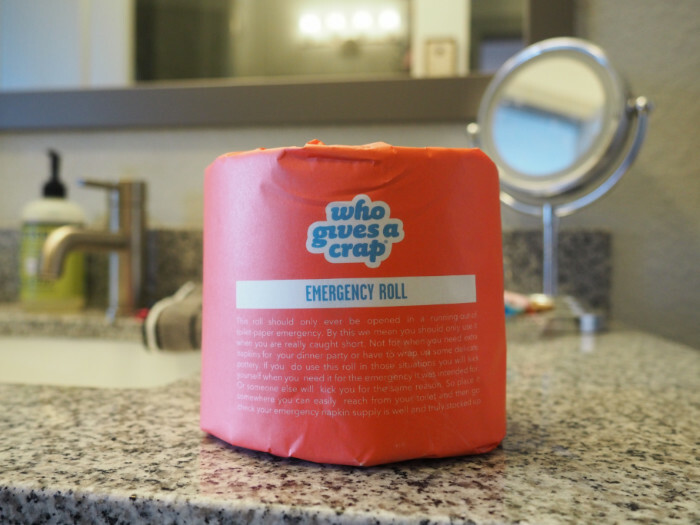 One fun little easter egg feature of Who Gives A Crap is that they include a couple of “emergency rolls“, wrapped in a bright red paper. The paper is printed with a message reminding you to reorder before you run out completely! I tucked the emergency rolls in the back of my cabinet so that they’ll be the last ones I use. 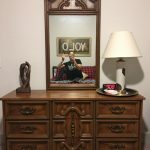 Upcycled Thrift Store Statement Art : YOLO! 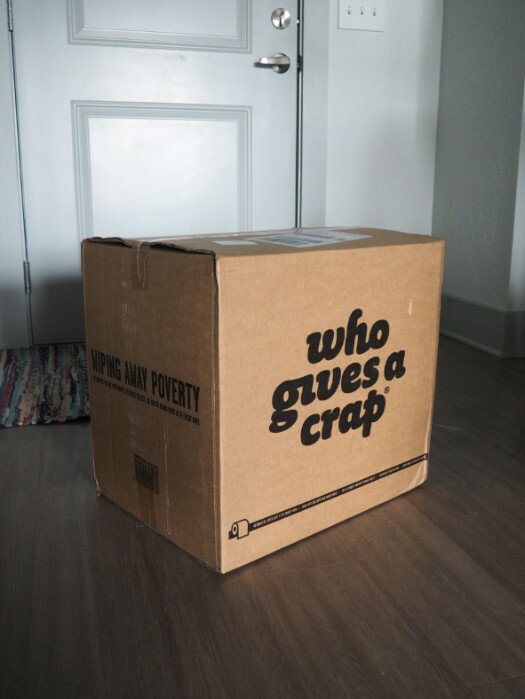 Click here to get $10 off your first Who Gives a Crap purchase! The title says it all: ya girl is headed to Mexico! In perfect synchronicity with my recent 30th birthday and one year anniversary of coming out, I’m off to Cancun on an Olivia vacation. And by a stroke of luck, I got hooked up with this new prAna bathing suit from their Spring 2018 line just in time for my trip. I have a hard time finding bathing suits that fit my criteria, but this one is great. I like the sporty cut of the Merrow top and that the Ikenna bottoms have laces on the sides that allow me to adjust them to fit the junk in my trunk. It’s cute for oceanside lounging, but also practical and won’t require me to constantly adjust it while swimming. Merrow top in Blue Graceful, size S. Ikenna bottom in Cargo Green, size S.
I love working with prAna because of their commitment to sustainability. They choose sustainable materials like organic cotton and hemp, treat workers fairly, and use environmentally responsible production methods. That means that even if I hadn’t received my prAna bathing suit for free, I could confidently shop with them and still meet my 2018 goal to shop sustainably all year long. The Merrow top comes in eight colors and the Ikenna bottom comes in six colors. Also, note the cutest photobomb. I can’t wait to wear my new suit on the beach in Cancun! If by chance you’ll be on the Olivia Cancun 2018 trip (or know someone who is), I’ll be speaking twice so come see me! I’m giving a talk called Finding Balance between Muscles and Mental Health on Monday afternoon and appearing on a panel hosted by Curve Magazine on Wednesday afternoon and would love to meet you. You can check out my other prAna reviews here: How to Live More Sustainably (Isaline bra and Shala pant) and Yoga Changed My Life (Mika top and Juniper pant). And if you’d like to cop a prAna bathing suit or some sustainably made clothing of your own, use code TREMS18 to get 15% off your purchase at prAna online! Click here to shop. Not only are they a certified B-Corporation based right here in the U.S., Stasher is a women-owned business. Now that’s a company I can get behind! Shop Stasher here. 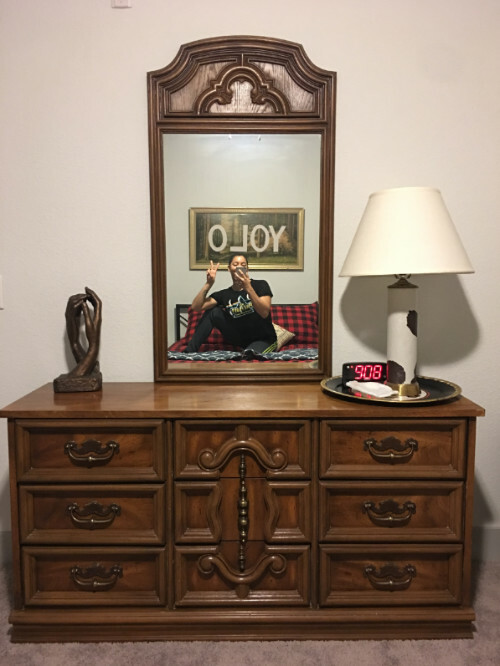 Wasting stuff freaks me out. I hate it. It really bothers me when food goes bad and I have to throw it away, and I cringe when I visit places that don’t participate in a recycling program. But just like everyone else, sometimes I waste food or throw away recyclable items out of convenience. After getting back to my roots in yoga and plant-based eating in 2017, I realized I also needed to get back to my roots and live more sustainably to be friendlier to the earth and reduce my ecological footprint. 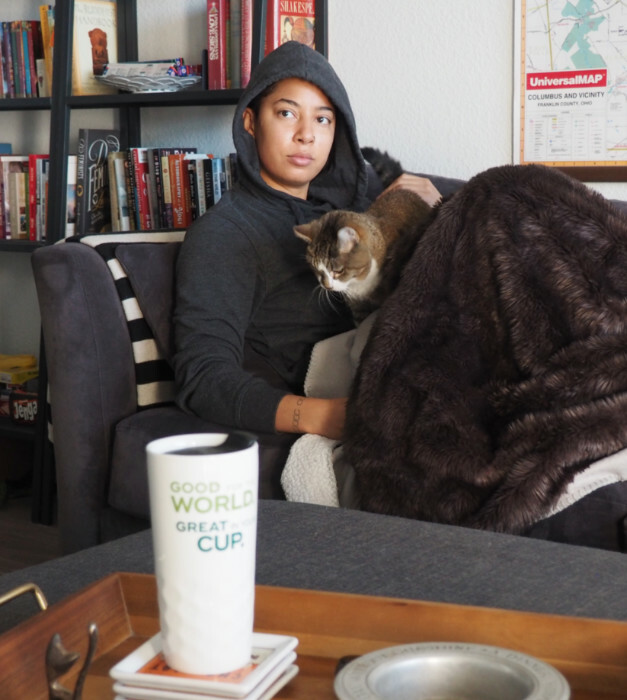 While I still have plenty of vices — I use WAY too much toilet paper and paper towel — but I’ve taken big steps to be mindful about creating less waste! I’ve been lucky to live in apartment complexes that participate in recycling programs. Everything I can recycle, I do. I’ve tried a lot of reusable water bottles in my day. My first one was a Nalgene, but lately I’ve been using this glass one from Anchor Hocking. 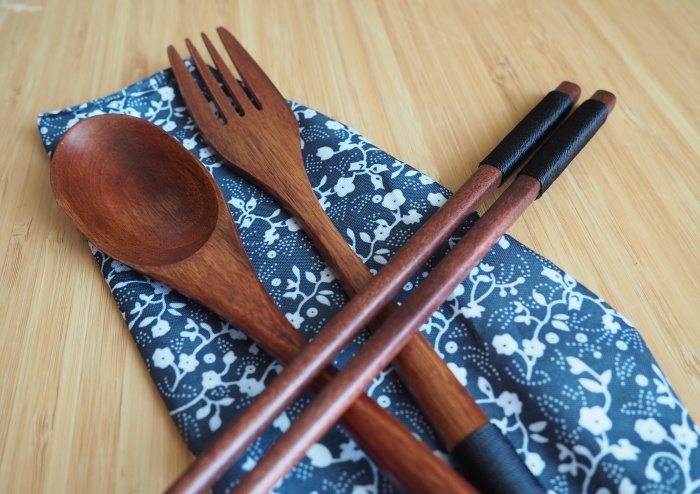 Along the same lines, another thing I’m trying is a set of lightweight wooden eating utensils that I can easily travel with. It’ll be convenient to always have them around when I’m on the go, and I’m hoping they will help me reduce the amount of plastic I use too. I realized this later, but a better choice would be a set of bamboo utensils like this because bamboo grows quickly and is a more renewable resource. One of my goals for the year is to shop sustainably for all my clothing and housewares. That means only buying things that are secondhand or are produced sustainably. For me, it won’t be too much of a challenge because I already enjoy thrift shopping and antiquing. Despite that, it’s already saving me money on impulse shopping! I was excited about partnering with prAna for this #mindfulprAna blog post because every clothing item they make is sustainably produced. That means prAna garments — like the Isaline bra and Shala pants I’m wearing above, sent to me for free from the new #prAnaSpring18 line — are made from renewable materials like cotton and hemp, and the workers who make them are treated and paid fairly. I feel good about adding these two items to my wardrobe! If you’re looking for new clothing that’s comfy, looks great, and is sustainably made, shop at prAna! Get 15% off any prAna purchase between Feb. 20 and Mar. 20, 2018 with code MPLMS18. Excludes clearance & markdown items. 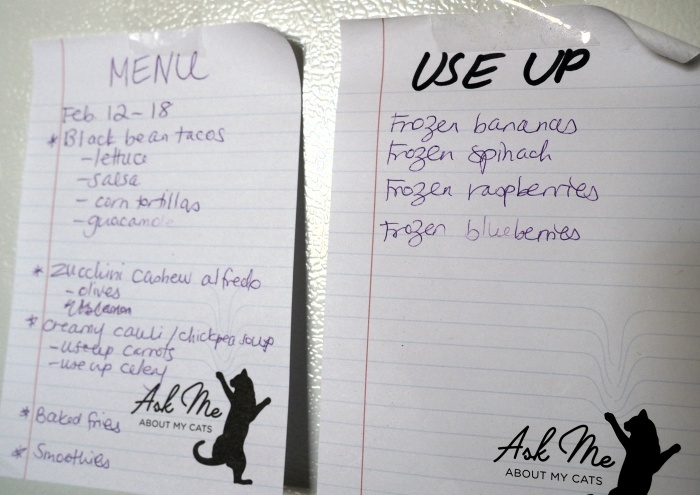 I’m lazy and sometimes find it irritating to have to plan out my meals for the week, but I’ve been doing it anyway in order to reduce the amount of food I waste. I’ve been checking out what’s already in my pantry and fridge, picking out a few meals I want to make for the week that use those items, and just shopping for the things I need to fill the ingredient gaps. Then I posted the week’s meal plan on the fridge so I can never say “there’s nothing to eat”. I also made a list of things in the freezer I want to use up before I move cities in about a month. It’s working! One last thing I’ve reincorporated into my strategy to reduce food waste is stashing veggie scraps in the freezer. Once I collect enough, I’ll be able to make my own veggie broth! 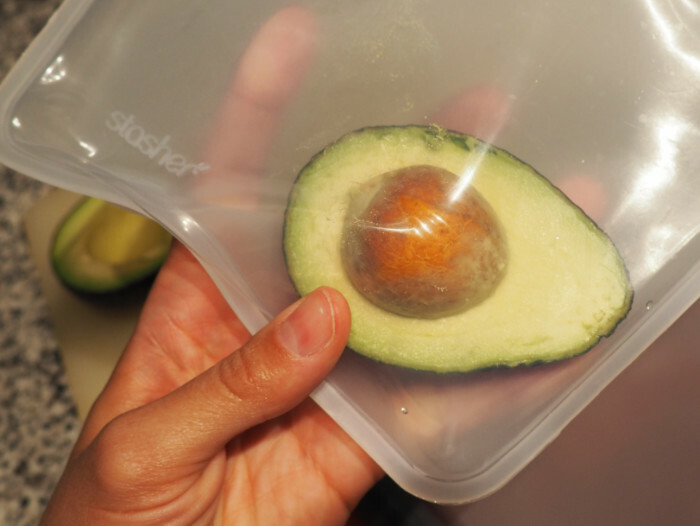 In the future, I hope to be able to compost things like this. What steps do you take to be more mindful or sustainable in your everyday life?